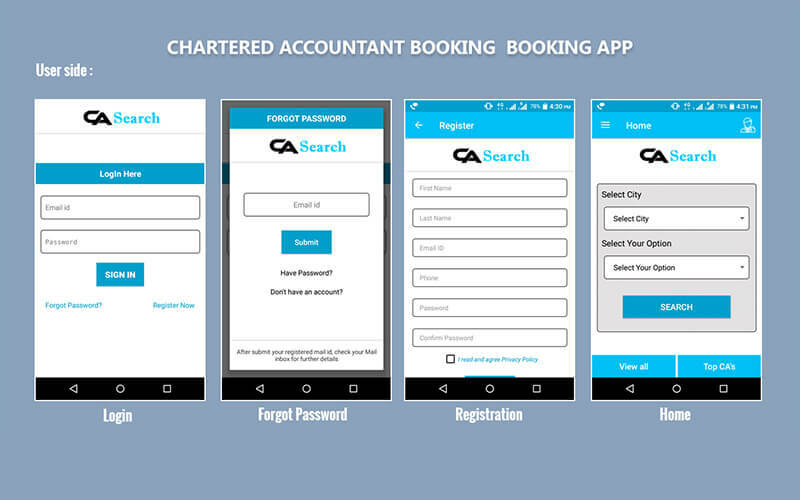 Chartered accountant booking android application is used to make the connection between the auditors and the customers to make the business more efficient. In this online world, everyone moves forward to do all those things online so it is the best app to make the connection between the auditors and users. Auditing is such a way that helps the business owners to make their business develop by knowing the right strategy to spend money on their business. The world is completely minimized into the computerized medium, so it is the best app to make your business improvement. This chartered accountant app is used to make your time and energy saved but producing the best output for your query. Auditor Booking Android App is completely created for the auditors and users delight with exceptional features included that every auditors and user needed. We have some types of features that completely customized based on the user’s requirements that the users looking these days trendy features. This app helps you to grow your business in every aspect to know like tax details, trademark, legal & copyright details, documentation. The user can log in the application with their valid email ID and password and also the user can provide their username and phone number etc; if they forgot the password, unfortunately, they can rest the password by on the bottom of the page. In the Android App for CA booking, you can search for the CA’s by three types. The user can search CA’s by the city or location, by category. And also search by top CA’s and view all CA’s. In the CA booking android app, there is a navigation menu that contains home, my profile, my reviews, my appointments, user reviews, manage license, log out options etc; In the search page results, the user or chartered accountant can see the list of the CA’s by their search where they can see the CA’s name, experience, address, experience and some other details that they have filled in their profile. The user can book the chartered accountant based on their needs and in my appointments page the user can see the booking details with the CA name, time, booking date and status of booking. Even the user can cancel the booking by clicking the cancel button. In this my appointments the CA can also see the request for booking from the user with username, date and contact number, etc; and also the CA can accept or reject the booking request from the users. In the reviews page, the user and CA can see the ratings and reviews for the CA that given by the user. We have created the android app with user-friendly navigation and mobile friendly responsive design to support all kind of mobile phones and tablets. PHP Scripts Mall is the most experienced web designing company having more than 15 years of experience in this field. We have a lot of valuable readymade scripts for various types of business; you can check it on our shop page. Such responsive app for the purpose of auditing. My profession becomes passion through this app as well as my reach in this market also goes to the level of next.